Roasted chestnuts make many people think of cold weather and the first line in Mel Tormé and Bob Wells' "The Christmas Song." Luckily, an open fire is not the only way to roast chestnuts, meaning that even home cooks can prepare them. Because raw chestnuts do not store well, you must roast the nuts and cool them if you plan to store them for any length of time. Raw chestnuts will get moldy within two weeks at room temperature or one month in the refrigerator. 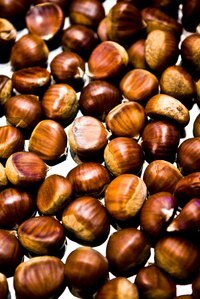 Put chestnuts out at room temperature for about three days before roasting them. This gives the nuts a sweeter flavor. Cut a slit in each chestnut shell with a sharp knife. If desired, you can cut two slits to make an "X" in each shell. The slits allow moisture to escape so the shells don't explode during roasting. Set the chestnuts on a baking sheet with the slit facing up. Bake the chestnuts for about 25 minutes at 425 degrees F.
Remove the sheet of nuts from the oven and allow them to cool for about five minutes. Peel the shells off the chestnuts as soon as they have cooled enough to safely handle them. The warmer the nuts are, the easier the shells are to peel off. Cool the shelled chestnuts on the baking sheet until they reach room temperature. Place the chestnuts in airtight plastic containers, such as thick zip-top plastic bags or plastic food storage containers. Place the containers of chestnuts in the refrigerator or freezer and store them for up to one year.